•I happen to live very close to the Rose Parade route. If you’re thinking about driving to the parade, please keep in mind that street and paid parking is somewhat limited near the parade route and traffic is usually extremely congested after the parade when tens of thousands of cars try to flee Pasadena as many thousands of cars are simultaneously entering Pasadena for the Rose Bowl game. That’s why many people take the Gold Line to the parade and game. •Metro is running all-night service on New Year’s Eve and into New Year’s Day for those going to the Parade early; the Parade begins at 8 a.m. on New Year’s Day. All-night service will be provided on the Red, Purple, Blue, Expo, Green, Gold, Orange and Silver Lines in addition to bus lines which normally operate late-night owl service. 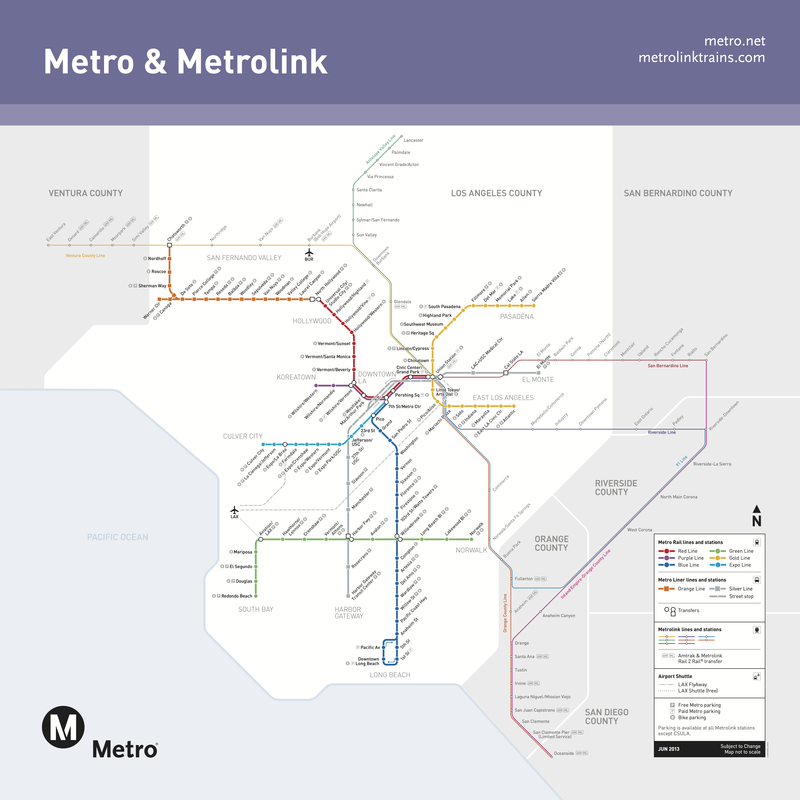 Trains will run at 20-minute intervals from 1 a.m. to 3 a.m.
•As both maps show, there is parking available at many Metro Rail stations, including Gold Line stations. Parking at most stations is free; it’s six dollars a day to park at Los Angeles Union Station. There are also many paid parking in lots in downtown Los Angeles that are near the Red/Purple Line subway that can be used to connect with the Gold Line at Union Station. Due to the large crowds expected to come out for the Rose Parade, oversize items such as umbrellas, chairs and coolers will not be permitted on the trains that day. •Fares on Metro Rail are purchased on reloadable plastic TAP cards, which can be purchased from ticket machines aboard Metro Bus lines and all Metro Rail stations for $1; the ticket machines at Metro Rail stations accept cash or credit cards. Fares are $1.50 per ride on a bus or train; there are no transfers available. If you need to transfer, please purchase a $5 day pass that allows for unlimited travel that day. More fare information here. 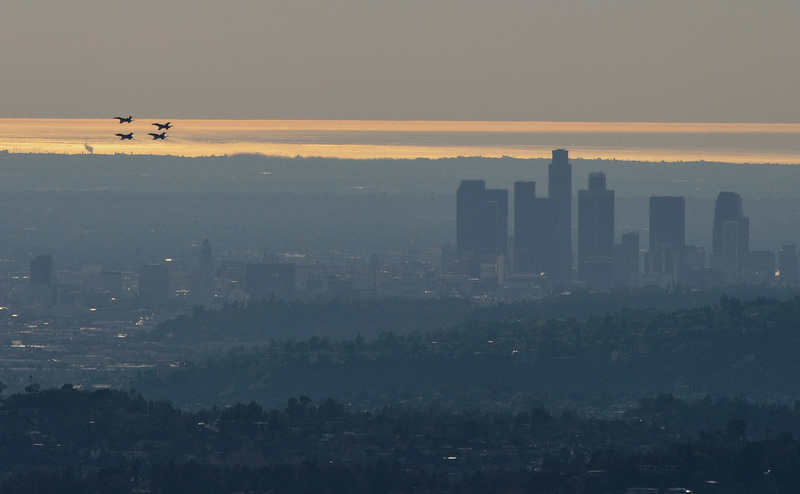 •Avoid long walks and the high cost of parking at the Rose Bowl — it’s $40 per car. 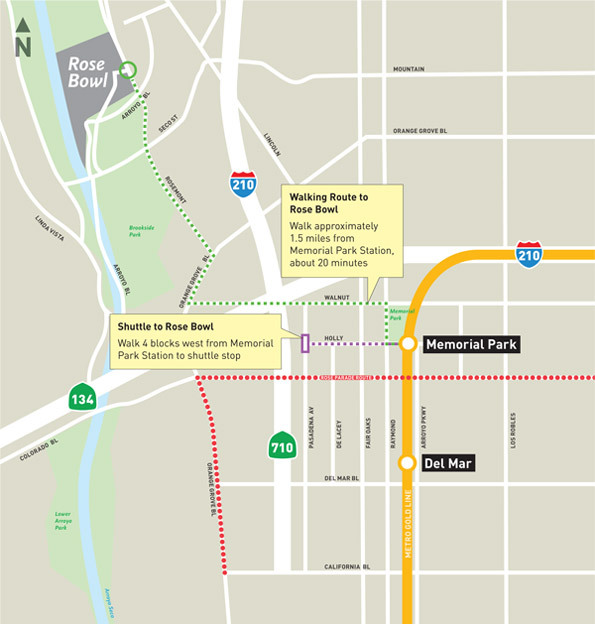 Take the Metro Gold Line to Memorial Park Station in Pasadena; then take a short walk to the Parsons Parking Lot B and ride a shuttle in comfort past the traffic, right up to the gate. Shuttle service to the Rose Bowl is free and begins at 10 am on January 1. If you are riding a Metro bus after the game, please check the individual timetables for last bus times leaving Pasadena. 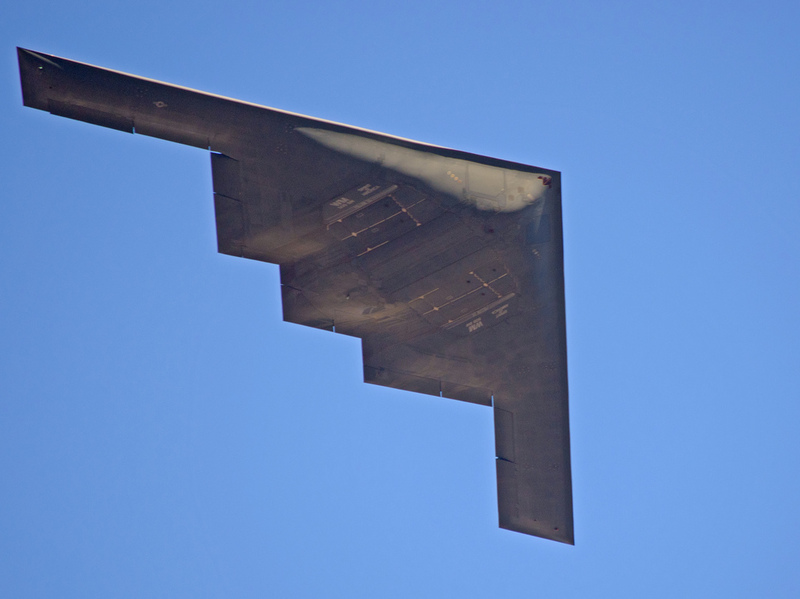 •As a side note, I would expect that both the station platform at the Allen station and the top of the parking garage at Sierra Madre Villa station would provide good views of the flyover that usually precedes the parade and game. I took the top photo from the parking garage at Pasadena City College along Bonnie Avenue; the bottom photo was taken from the Sam Merrill Trail to Echo Mountain; the trailhead is located at the top of Lake Avenue in Altadena. Is there a way to find out how bus routes that normally cross and/or travel on Colorado blvd will be affected? I’d like to take the 687 from my house to the parade but am not sure when it will stop/resume service. You can also use the Metro App or Nextbus for help planning your trip. Thanks! How long can I park at the Sierra Madre Villa station? I ask because I’d like to park there, take Metro to the Grand Park NYE LA event, come back to Pasadena, wait for the Rose Parade and then pick up my car after the parade concludes. Do you thing parking will be available at the Sierra Madre Station in the early am so that I could take the train into Pasadena for the parade? Hard to say. It’s a big garage but it’s a big event. I expect it will likely fill early. You can always try and if filled, look for street parking nearby. Unfortunately, it’s hard to say. Parking does tend to fill up fast due to the number of people attending, so it really depends on how early you plan to arrive. Another option might be to try parking further away and taking Foothill Transit towards Pasadena. Hope that helps! By the way, congratulations on 10 years of Metro Day Pass!! I read in the article that large items will not be allowed. I assume that will hold for luggage as we are changing hotels from LA to Pasadena on the 1st and will need to bring it with us. Can we bring it? If not will it be allowed on buses or any public transportation? Any luggage that is large — ie beyond backpack or a personal size — is discouraged because the trains will be crowded–unless you are headed out of Pas before the parade gets going. If you have a lot of stuff may be better to take shuttle to airport or cab to Union Station and take the Flyaway bus from there. Do you know if the rail will operate all night after the BCS game as well on the 6th? I’m worried about getting back to my LAX hotel if the game runs late. Also is it better to take the gold, blue, red lines to the gold line, or is the flyaway bus a better option from LAX? Thanks! Metro won’t be running late night service for the BCS game, but it’s expected to end around 9PST which leaves plenty of time to get home. We’ll have more details about service to the game Thursday. In terms of what to take, it’s probably best to buy a $5 Day Pass – you’ll need to get a TAP card, which costs $1 at the ticket vending machines – and use Metro all the way. 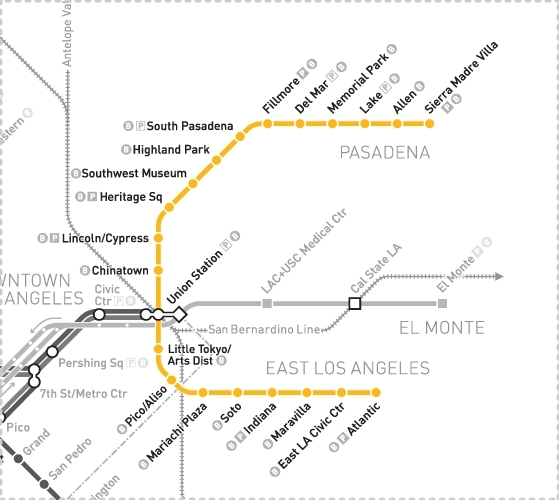 The LAX Flyaway costs $8 one way and you’d still have to transfer from Union Station to the Gold Line to get to Pasadena. If you want other options, try the Trip Planner at metro.net – there might be a bus you can take that would require less transfers! We really need direct front-of-the-door Metro rail access to our sporting venues. Do you know how the National Championship Game will be handled and will it be similar to how things will work for that. Yes, and more details on that will be posted Thursday, but short answer is Gold Line will run enhanced service for the BCS game. If i leave at 10 from orange/yorba linda area & its about an hour to LA is that enough time (including possibility of being lost and the anxieties that brings :] ) is it likely to get to the union station area and on a train by 11 or is closer to 11:40 more realistic & area pay stations for metro passes right in that parking vicinity? Trying to get a visual- THANK YOU! !